How to Call Sweden from the U.S. Your calls to Sweden from the U.S. can be as easy as en, två, tre. Not sure how? Then follow this helpful “How To Call Sweden” guide below. Next dial 46, the country code for Sweden. Then dial the 1- to 3-digit area code (see sample calling code list below) and finally the 5- to 8-digit phone number. Need more help with how to call Sweden? Don’t fret if you’re looking for a great deal on making unlimited¹ calls to Sweden. 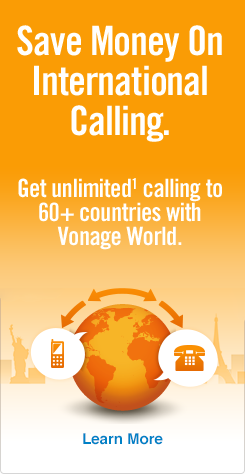 You’ll find no tricky calling cards or limited cell service with Vonage’s international phone service! From Eskilstuna to Helsingborg, keep in touch with your dearest but not-so-nearest through Vonage World®. It’s so simple — all you have to do is sign your relatives up for a Vonage World account and ship them a Vonage Box™.² After that they can make unlimited¹ calls to landlines and mobile lines anywhere in the U.S., whenever they want. So now your loved ones in Orebro will have the same area code in the U.S. as you. Get in touch with them through your U.S.-based phone number…and so can anyone else in the U.S.
No cumbersome international rates every time you need to call Sweden from United States lines. Plus, if you both have Vonage, all calls are included…for no additional charge. And just so you know, anywhere there are high-speed Internet connections, Vonage can be up and running! Are there any international calling apps? Check out Vonage Mobile for international calling apps for iPhone® & Android™ devices. ²You sign up for an additional account and remain responsible for all charges and activity on each account, as well as shipping for the adapter and for compliance with the laws of the country outside of the U.S. where the Vonage adapter may be used. Vonage customer support is in English and Spanish only. Vonage 911 service does not operate outside the U.S.